Hey folks, this is a long-overdue update on Michelle. 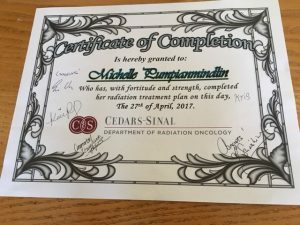 She finished her radiation at the end of April. Five treatments altogether to get rid of that one last stubborn tumor, once and for all. She even graduated with a Certificate from the School of Radiation. That was an undergraduate degree and she’s debating getting her Masters in, Glowing in the Dark. Because of the radiation, she’s still fighting pretty bad fatigue and her digestive system has been all messed up. In fact the only food she can eat has to be white, which, if you think about it is pretty appropriate considering the administration we have right now. Michelle basically hasn’t felt good for over nine months and she didn’t even have a baby, thank God!! Pain from radiation hangs on. She will have a PET scan at the beginning of June to make sure the hotspots that were left around are gone. (And I don’t mean clubs on the Sunset strip). I’m however still confused about what hotspots are? 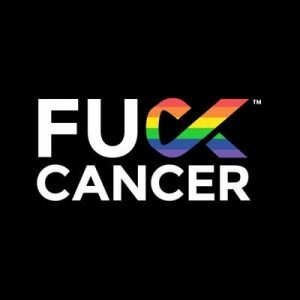 So the score is two tumors down and the third zapped by radiation and hopefully obliterated. That’s the news. All prayers and positive thoughts are appreciated. Love to all in these crazy times! Next story REMISSION, REMISSION = HAPPY ENDING! LAST BLOG! Previous story 18th Overtime! This game is toooo long! Ready to go home!